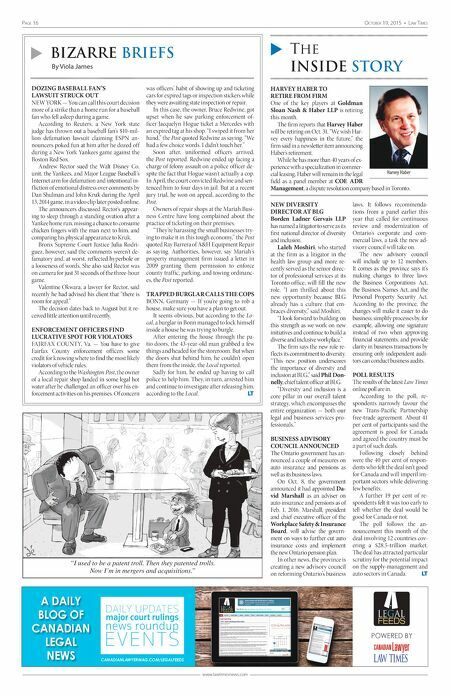 Page 16 OctOber 19, 2015 • Law times www.lawtimesnews.com HARVEY HABER TO RETIRE FROM FIRM One of the key players at Goldman Sloan Nash & Haber LLP is retiring this month. The firm reports that Harvey Haber will be retiring on Oct. 31. "We wish Har- vey every happiness in the future," the firm said in a newsletter item announcing Haber's retirement. While he has more than 40 years of ex- perience with a specialization in commer- cial leasing, Haber will remain in the legal field as a panel member at COE ADR Management, a dispute resolution company based in Toronto. DOZING BASEBALL FAN'S LAWSUIT STRUCK OUT NEW YORK — You can call this court decision more of a strike than a home run for a baseball fan who fell asleep during a game. According to Reuters, a New York state judge has thrown out a baseball fan's $10-mil- lion defamation lawsuit claiming ESPN an- nouncers poked fun at him after he dozed off during a New York Yankees game against the Boston Red Sox. Andrew Rector sued the Walt Disney Co. unit, the Yankees, and Major League Baseball's Internet arm for defamation and intentional in- f liction of emotional distress over comments by Dan Shulman and John Kruk during the April 13, 2014 game, in a video clip later posted online. The announcers discussed Rector's appear- ing to sleep through a standing ovation after a Yankee home run, missing a chance to consume chicken fingers with the man next to him, and comparing his physical appearance to Kruk. Bronx Supreme Court Justice Julia Rodri- guez, however, said the comments weren't de- famatory and, at worst, ref lected hyperbole or a looseness of words. She also said Rector was on camera for just 31 seconds of the three-hour game. Valentine Okwara, a lawyer for Rector, said recently he had advised his client that "there is room for appeal." The decision dates back to August but it re- ceived little attention until recently. ENFORCEMENT OFFICERS FIND LUCRATIVE SPOT FOR VIOLATORS FAIRFAX COUNTY, Va. — You have to give Fairfax County enforcement officers some credit for knowing where to find the most likely violators of vehicle rules. According to the Washington Post, the owner of a local repair shop landed in some legal hot water after he challenged an officer over his en- forcement activities on his premises. Of concern was officers' habit of showing up and ticketing cars for expired tags or inspection stickers while they were awaiting state inspection or repair. In this case, the owner, Bruce Redwine, got upset when he saw parking enforcement of- ficer Jacquelyn Hogue ticket a Mercedes with an expired tag at his shop. "I swiped it from her hand," the Post quoted Redwine as saying. "We had a few choice words. I didn't touch her." Soon after, uniformed officers arrived, the Post reported. Redwine ended up facing a charge of felony assault on a police officer de- spite the fact that Hogue wasn't actually a cop. In April, the court convicted Redwine and sen- tenced him to four days in jail. But at a recent jury trial, he won on appeal, according to the Post. Owners of repair shops at the Mariah Busi- ness Centre have long complained about the practice of ticketing on their premises. "They're harassing the small businesses try- ing to make it in this tough economy," the Post quoted Ray Barrera of A&H Equipment Repair as saying. Authorities, however, say Mariah's property management firm issued a letter in 2009 granting them permission to enforce county traffic, parking, and towing ordinanc- es, the Post reported. TRAPPED BURGLAR CALLS THE COPS BONN, Germany — If you're going to rob a house, make sure you have a plan to get out. It seems obvious, but according to the Lo- cal, a burglar in Bonn managed to lock himself inside a house he was trying to burgle. After entering the house through the pa- tio doors, the 43-year-old man grabbed a few things and headed for the storeroom. But when the doors shut behind him, he couldn't open them from the inside, the Local reported. Sadly for him, he ended up having to call police to help him. They, in turn, arrested him and continue to investigate after releasing him, according to the Local. LT A DAILY BLOG OF CANADIAN LEGAL NEWS FEEDS LEGAL POWERED BY CANADIANLAWYERMAG.COM/LEGALFEEDS FEEDS LEGAL POWERED BY LegalFeeds_LT_Dec1_14.indd 1 2014-11-26 9:44 AM u Bizarre Briefs By Viola James u The InsIde story NEW DIVERSITY DIRECTOR AT BLG Borden Ladner Gervais LLP has named a litigator to serve as its first national director of diversity and inclusion. Laleh Moshiri, who started at the firm as a litigator in the health law group and more re- cently served as the senior direc- tor of professional services at its Toronto office, will fill the new role. "I am thrilled about this new opportunity because BLG already has a culture that em- braces diversity," said Moshiri. "I look forward to building on this strength as we work on new initiatives and continue to build a diverse and inclusive workplace." The firm says the new role re- f lects its commitment to diversity. "This new position underscores the importance of diversity and inclusion at BLG," said Phil Don- nelly, chief talent officer at BLG. "Diversity and inclusion is a core pillar in our overall talent strategy, which encompasses the entire organization — both our legal and business services pro- fessionals." BUSINESS ADVISORY COUNCIL ANNOUNCED The Ontario government has an- nounced a couple of measures on auto insurance and pensions as well as its business laws. On Oct. 8, the government announced it had appointed Da- vid Marshall as an adviser on auto insurance and pensions as of Feb. 1, 2016. Marshall, president and chief executive officer of the Workplace Safety & Insurance Board, will advise the govern- ment on ways to further cut auto insurance costs and implement the new Ontario pension plan. In other news, the province is creating a new advisory council on reforming Ontario's business laws. It follows recommenda- tions from a panel earlier this year that called for continuous review and modernization of Ontario's corporate and com- mercial laws, a task the new ad- visory council will take on. The new advisory council will include up to 12 members. It comes as the province says it's making changes to three laws: the Business Corporations Act, the Business Names Act, and the Personal Property Security Act. According to the province, the changes will make it easier to do business; simplify processes by, for example, allowing one signature instead of two when approving financial statements; and provide clarity in business transactions by ensuring only independent audi- tors can conduct business audits. POLL RESULTS The results of the latest Law Times online poll are in. According to the poll, re- spondents narrowly favour the new Trans-Pacific Partnership free-trade agreement. About 41 per cent of participants said the agreement is good for Canada and agreed the country must be a part of such deals. Following closely behind were the 40 per cent of respon- dents who felt the deal isn't good for Canada and will imperil im- portant sectors while delivering few benefits. A further 19 per cent of re- spondents felt it was too early to tell whether the deal would be good for Canada or not. The poll follows the an- nouncement this month of the deal involving 12 countries cov- ering a $28.5-trillion market. The deal has attracted particular scrutiny for the potential impact on the supply-management and auto sectors in Canada. LT Harvey Haber "I used to be a patent troll. Then they patented trolls. Now I'm in mergers and acquisitions."